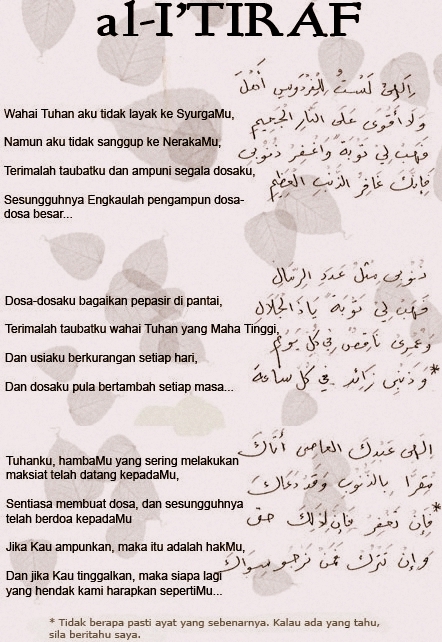 This doa has been put to song, together with a lovely malay translation, by Junied, a nasheed group from Singapore associated with the Madrasah Aljunied Al-Islamiah. Madrasah Aljunied is a famous madrasah, having produced many notable scholars over the course of its nearly one hundred years, including the present Mufti of Sarawak, if I’m not wrong. It is now absorbed into the national education system, so the national curriculum is taught together with the religious sciences. You can learn more about how Singapore has absorbed the madrasah schools into their national model here at MUIS. You can download the Doa Taubat from their website, along with several other songs. There are video recordings available on YouTube as well. According to their site, they have a new album called “Hijrah” available in stores. Unfortunately, googling around did not readily turn up a merchant site. Anyone who knows where to get a copy of the album can let me know in the comments. The group’s recording of the Doa Taubat can be found all over, but the website of the group itself I couldn’t find after half an hour of searching. It’s puzzling too, because I found it once before a few months ago. A recording of the Doa Taubat is available to download on the site, but since I can’t locate it, I’m putting my copy here for download. It’s very nice; you should listen. I’ll take it down and link to theirs as soon as I locate their site again or some kind soul sends me the link. The song is in Arabic and Malay, so I decided to do a rough English translation which you can find below. It’s not an exact translation: I tried to keep to the flow of the original so it could conceivably be sung in the same tune, but that meant I had to play loose with the meaning. Here it is; comments welcome as always. When folks take a prayer of repentance and put it to a very pleasant song, what is the environment/context in which you would listen to it? This style of music – nasheed – is religious music and plugs into life here in a way not unlike Gospel in the States. It is often performed at religious functions, like this one at my local mosque after the month of Ramadan, or at religious conferences or assemblies. Nasheed does get a bit of play on the radio, on the Islamic channel, where it may come off a bit incongruous I suppose, if you tuned it in when you weren’t feeling particularly prayerful at the time. But even then, if it brings somebody back to a God-conscious frame of mind in the middle of their work day, I’d say that’s a good thing. A sample of the song, at least, can be found here. Not that I really went out looking for it, ya know? 😉 I just happened to see that the school had a choir website and I thought it’d be interesting to see it. Yeesh, why could I not locate that yesterday? Junied.net – you’d think that would come up on a search for madrasah aljunied… Thanks, JD. I’m going to add that in up above; maybe that’ll help drum up a bit of publicity for their site. Isn’t the song also sang by Raihan? Yes, they have a version called “Iktiraf”. The malay translation in that song is slightly different from the Junied version, and there is an extra set of verses too. Here’s a youtube version upped by our good friend Tawel Sensei. I’m a Singaporean based in KL and I do have the CD with me. Do you want one? Totally unrelated, but I just read Other Malaysia’s post that you linked to here. Certainly what he complaint about is shared by many!! Does anyone know the sufi master that wrote the dua taubat. I have seen it somewhere, but as usual when I needed it I couldn’t find it. Can anyone help me please! Does any1 know where to get this dua….in arabic script online? Thank You. Its definitely a great piece of nasheed. I must digress – but I can’t resist – with my favourite story about seeking Allah ‘s forgiveness and the value of istighfar. It is said that this constant seeking of forgiveness opens doors. One night the ageing Ahmad bin Hanbal, exhausted from a day of travel, sought shelter for the night in a mosque but the caretaker turned him away. He could’ve dropped his own name to gain the favour, as he was by then at the height of his fame, but humility prevented him from doing so. And so persistent was the caretaker man in discharging his duty that not only did he shoo him out but also dragged the old Imam from inside the mosque to the door. A baker who was watching all that felt sorry for the old man so he took him home as guest for the night. As the baker was doing his work, Ahmad bin Hanbal was watching him. He saw that the baker kept repeating his istighfar, now and again and for ever more. “Oh baker, why do you do so? What benefits from it has He bestowed?” asked the Imam Ahmad. “By my asking His forgiveness constantly, alhamdulillah, He the Almighty has granted my every wish,” said the baker. “Except one. “And what could that one be that you still so desire?” asked the old Imam.